Twenty-three different galleries feature amazing items related to the history of aviation and space flight throughout the world. ‘Milestones of Flight’, ‘Pioneers of Flight’, ‘Aviation in WWII’ and ‘Space Race’ are some of the exhibits that fascinate visitors to the museum. From planes and space modules to flight simulators, interactive exhibits, the Albert Einstein planetarium and an IMAX theater, the Smithsonian Air and Space Museum educates and entertains guests of every age. Guided tours are also available as well as a three-level museum shop and food court. The masterful drawings of Leonardo da Vinci and mythological stories like the cautionary tale of Icarus flying too close to the sun reveal humanity’s enduring fascination with flight and space travel. The National Air and Space Museum chronicles the efforts of famous engineers, scientists, aviators and astronauts. Learn how these pioneers pushed the limits and slipped the surly bonds of earth on their quests to venture where no one had gone before. The museum is situated on the former site of the District’s armory, which served as a hospital during the Civil War. Originally the National Air Museum, the institution was established by an act of Congress in 1946. With the space race in the 1950s, the museum was renamed the National Air and Space Museum. A portion of the collection was initially displayed in a variety of locations, including the Art and Industries Building and a tent erected behind the Smithsonian Castle. The majority of the collection remained in storage until completion of the current pink Tennessee marble building in 1976. The design features marble cubes connected by three spacious glass and steel glass atria. While the cubes accommodate smaller pieces and theatrical exhibits, the larger gallery space of the atria is used to display rockets, airplanes and spacecraft. Some of the pieces in the collection, like the Chinese Imperial kites, date from the 1876 Centennial Exposition held in Philadelphia. The Stringfellow steam engine, designed to power aircraft, was added 23 years later. There is also a genuine moon rock. The museum is organized into several galleries dedicated to major aspects of flight. The entrance hall contains the Milestones of Flight celebrating some of the most significant aircraft in history. These include the Spirit of St. Louis flown by Charles Lindbergh, the Bell X-1 and John Glenn’s Friendship 7 space capsule as well as the Mariner Pioneer and Viking space probes. Legendary test pilot Chuck Yeager was at the controls of the X-1 when he broke the sound barrier for the first time in history. In other exhibits, you can gain deeper insights about the space race and aircraft carrier deck landings. With the Kitty Hawk Flyer as its centerpiece, the Wright Brothers and the Invention of the Aerial Age Gallery tells the story of the first powered flight. It also relays how aviation had a monumental impact on the world in the following decades. The Pioneers of Flight Gallery pays tribute to other men and women who overcame physical, psychological and societal barriers at the birth of aviation. In addition to a plane flown by Amelia Earhart, there is an exhibit commemorating the legacy of African-Americans in aviation. Several exhibits are dedicated to military aircraft, aerial combat and unmanned aerial vehicles. Other exhibits teach visitors about jet aircraft, air travel and the golden age of general aviation. Children will enjoy the hands-on How Things Fly Gallery that features interactive exhibits explaining the principles of flight and space travel. In addition to a gallery dedicated to the use of aircraft and space observations to better understand our home planet, the museum also houses exhibits chronicling the history and achievements in space exploration. A gallery features various spacecraft used in the initial exploration of the moon. Featuring a replica of the Voyager, the Exploring the Planets exhibit takes you through the universe to visit other planets. Learn how astronomical tools have advanced and revolutionized our understanding of the universe. The Apollo to the Moon Gallery chronicles the events that led to Neil Armstrong’s historic giant leap for mankind. The museum also houses a planetarium and IMAX theater. The Einstein Planetarium offers a number of complimentary star shows, including the night sky and trips through the universe. Purchase tickets to view movies in the Lockheed Martin IMAX Theater that show the earth in 3D, a journey through the history of flight and how engineers transform the world. The Steven F. Udvar-Hazy Center is located at Dulles International Airport. It houses a variety of aircraft including the B-29 Superfortress Enola Gay, an SR-71 Blackbird and the Space Shuttle Discovery. The museum is open free of charge from 10 a.m. until 5:30 p.m. every day except Christmas. There are extended hours on select days during spring and summer. Visit the National Air and Space Museum website for more details. The lines to enter the museum are the longest on weekends and holidays as well as the peak season from March to August. Dress comfortably and carry a limited number of bags. All visitors are required to pass through a metal detector. You are free to take pictures and connect to the museum’s complimentary Wi-Fi system. While only bottled water is permitted in the galleries, the museum has a food court offering a variety of fast food, snacks and beverages. The District is renowned for its congested traffic and minimal parking near many of its popular attractions. There is no need to worry about driving or trying to find a parking spot when you ride the Old Town Trolley. Set your worries aside, sit back and relax as your knowledgeable conductor transports you to the National Air and Space Museum. You will be regaled along the way with an educational and entertaining narration about the nation’s capital. Step off the trolley when you want and explore points of interest at your own pace. Hop aboard the next trolley and continue the popular sightseeing tour right where you left off. There is a stop in front of the National Air and Space Museum. 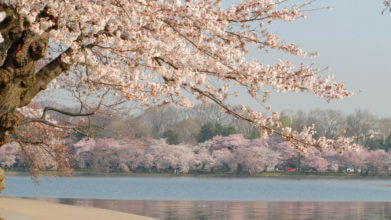 If time permits, visit one of these other popular attractions within walking distance of the National Air and Space Museum. The third-most visited museum in the world, the National Museum of Natural History is a multi-story structure housing a more than 124 million piece collection. In addition to the Hope Diamond, items on display include fossils and human cultural artifacts that chronicle the natural history of the planet. The faux Norman-style Smithsonian Castle was built in 1849 to initially house the institution’s ever-growing collection of artifacts. The distinctive red Seneca sandstone edifice houses the crypt of benefactor James Smithson as well as galleries featuring a sampling of artifacts displayed by the Smithsonian’s numerous individual museums. The U.S. Botanical Garden displays almost 10,000 living plant specimens, some of which are more than 165 years old. It features plants indigenous to the United States as well as tropical, exotic, rare and endangered specimens from around the world. Exhibits reflect desert, jungle and woodland biospheres.